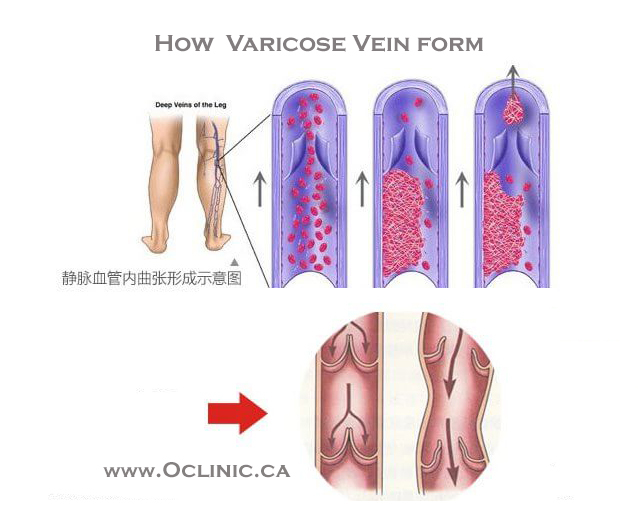 Angiogenesis means the growth of blood vessels. Your body usually knows how to regulate the growth of blood vessels, but sometimes there are defects in blood growing and pruning. Too little angiogenesis can lead to things like wounds that won't heal, heart attack, and other diseases. Too much angiogenesis leads to other bad things such as blindness, arthritis. It's is a common denominator of many diseases. It's also the "hallmark of every type of cancer." In autopsies of people who died in car accidents, doctors have found microscopic cancers in 40% of woman (breast) and 40% of men (prostate). Something like 70% of older people have microcancers in their thyroid. But the cancer is harmless -- "cancer without disease." If you block angiogenesis, the cancer can't grow. "It's a tipping point between harmless cancer and deadly one." Li showed a photo of a poor dog with gnarly tumor hanging off its side. The vet gave the dog three months to live. They started anti-angiogenesis drugs. 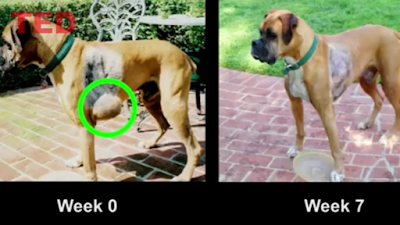 In a few weeks, the tumor shrank away completely. They also cured a dolphin of mouth cancer and saw a complete remission of a deadly lip cancer on a horse. Today there 12 different anti-angiogenesis drugs available for people and dogs. They are quite effective for many cancers, but not much for liver, lung, and breast cancers. The problem with these cancers is that by the time they are detected they have progressed too far for anti-angiogenesis drugs to do their work. The good news, Li says, is that "we eat to starve cancer." 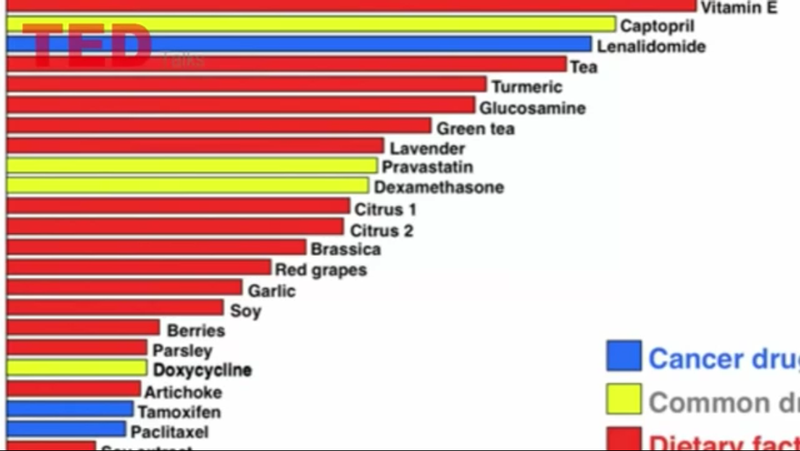 Lots of foods contain naturally occuring inhibitors of angiogenesis, and many are even better than drugs for blocking angiogenesis (see image below). 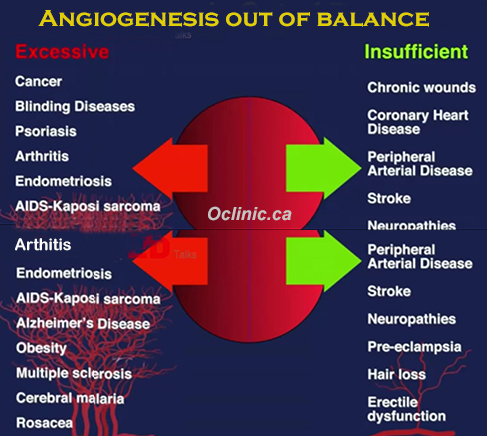 Angiogenesis also plays a huge role in obesity. "Adipose tissue is highly angiogenesis-dependent." You can cycle the weight of mice by inhibiting and promoting angiogenesis. "We can't create supermodel mice -- it takes them to normal weight." Dr. William W. Li is an international expert on health and disease fighting based on diet, lifestyle, and treatments that keep the body’s blood vessels in balance. As President and founder of the Angiogenesis Foundation, he is leading a worldwide effort to bring forth revolutionary health improvement emerging from cutting edge medical research.A native of Pittsburgh, Pennsylvania, Dr. Li received his undergraduate degree from Harvard College, and his medical degree from the University of Pittsburgh School of Medicine. 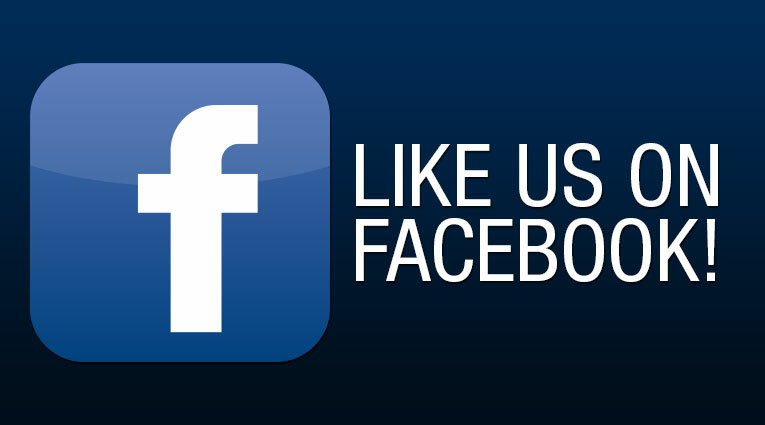 He completed his clinical training in Internal Medicine at the Massachusetts General Hospital in Boston. Yesterday(June 22) a middle-aged gentleman Edmund who is referred by the dentist at Bellesmere Dental Clinic(right next door to Oriental Acupuncture Clinic), came in for inquiring about acupuncture treatment for his neck stiff problem and also his blocked ear problem and sometimes headache also low back pain. 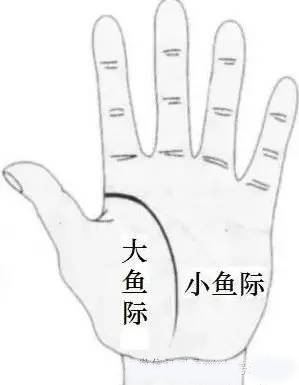 Because he had never tried acupuncture before, so Jarry gave him a free trial treatment. 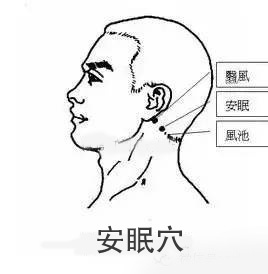 After half an hour treatment, he said that he felt his neck loosen up and his ear is cleared up too. 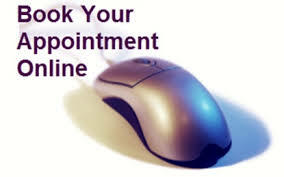 So he scheduled an appointment with Jarry for next Monday which is 4 days away. But surprisedly he came again today and asked if he can see Jarry again today for acupuncture, because he felt the improvement from yesterday trial treatment. so he'd really like to take the treatment more often, not just waiting until next Monday. Jarry do have a lot of patients like him that want to take the treatment more often so they can get better sooner. 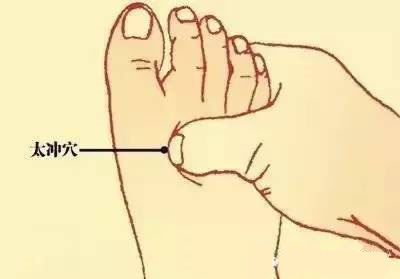 But Jarry always told them honestly that 2 to 3 times acupuncture treatment a week is good for most of patients, after every treatment, patients need couple days to recover their energy(or Qi). For older patients, maybe only one time treatment a week is better. 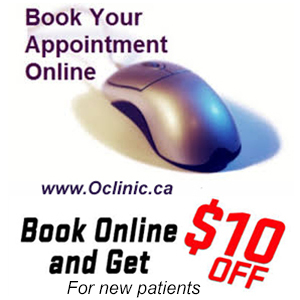 A 69 year-old lady referred by the dentist next door, came in to see Jarry for weight loss, when she mentioned to Jarry that she also has Sciatica and knee pain, Jarry told her to treat that problem first , so Jarry focused on her knee and Sciatica pain treatment. 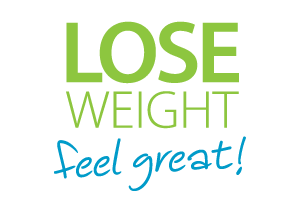 But surprisedly she told us that she lost 5 lbs so far after 8 section treatment (30'/section), she is very happy for that.At the same time her knee pain is gone after 8 section treatment and her Sciatica pain is also gone after 19 section treatment. 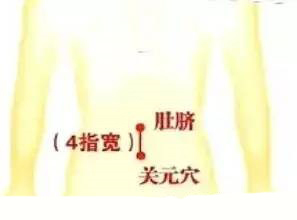 A 45 year-old lady got a horsebean size lipoma on her neck, which seemed growing fast. She was so worried, not sure what it was, so she came for Jarry's acupuncture treatment. 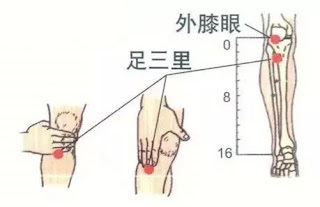 After 8 sections treatment, the lipoma reduced to a soybean size, and after 2 more sections treatment, she said no more lipoma and continue the treatments for her other health condition. Lipomas are masses of fat cells that grow together, forming a lump under your skin. Lipomas are usually small -- less than 2 inches in diameter -- and feel doughy or spongy to the touch. 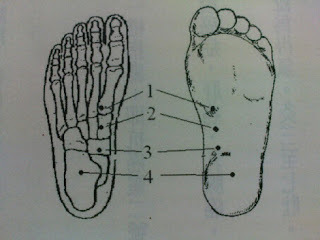 The exact cause of lipomas is not completely understood, although they are thought to develop due to a genetic predisposition, notes OrientalAcupuncture.ca Practitioners of acupuncture, a traditional Chinese medical treatment, believe that lipomas occur in part due to a stagnation in your body's flow of qi - also referred to as "life force energy." 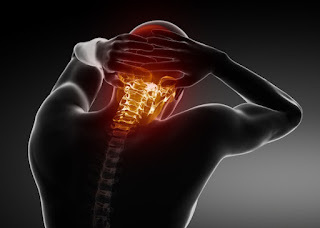 You may experience pain if the lipoma is located near nerves or contains numerous blood vessels; however, most people experience little or no troublesome symptoms. Pain or cosmetic factors are the most common reasons for surgical removal. 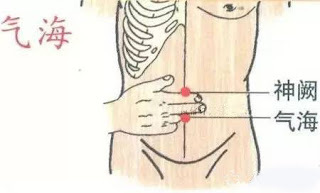 Acupuncture treatments for lipomas may involve inserting needles around the lipoma or stimulation of the acupuncture point located along the spleen and liver meridians. The spleen and liver are common area of stagnating qi or energy congestion. 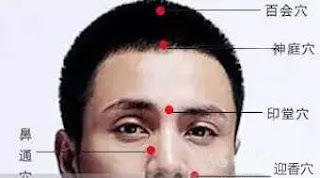 This congestion can manifest as lipomas on your skin or cause other skin disorders as well as additional symptoms like fatigue, depression or anxiety. As such, acupuncture may help open energy blockages and help alleviate lipoma-related symptoms of pain or discomfort. 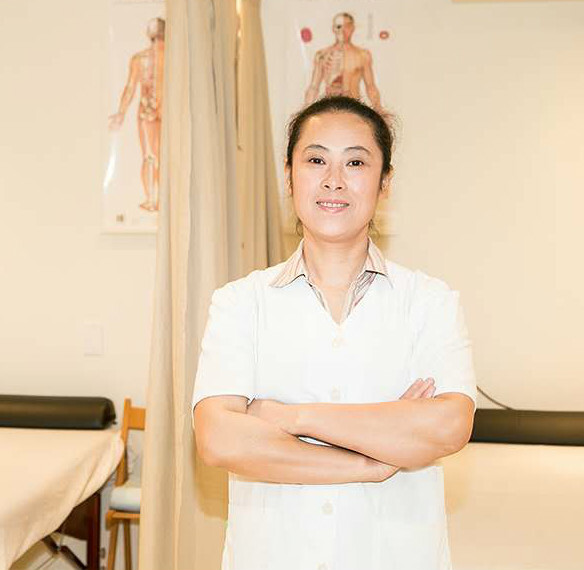 While acupuncture may provide some benefit for lipomas, you should not rely on acupuncture or any form of alternative medicine to self-treat your condition. Do not attempt to self-diagnose lipomas. A lipoma can resemble certain types of malignant or benign tumors. 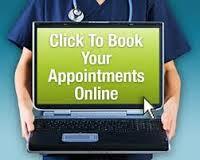 You should consult your doctor as soon as possible if you develop any swelling or lump on your body. 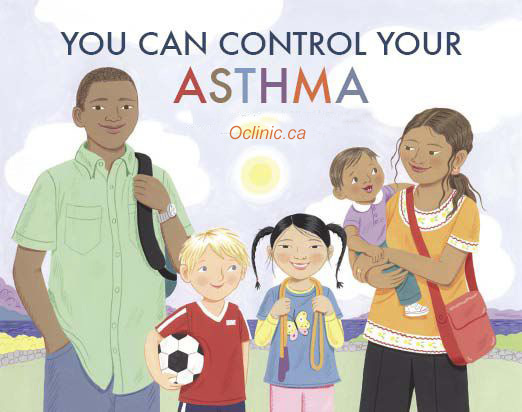 Asthma affects approximately 2 million Canadians every year. 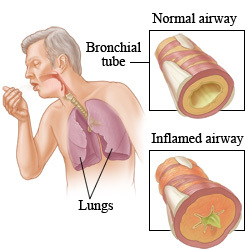 Conventional treatment options are limited to steroid inhalers and bronchodilators. While these medications are effective in relieving the symptoms of asthma, the side effects of continuous long-term treatment can be severe. There are numerous natural strategies to consider for chronic asthma that can offer effective treatment without the side effects. Quercetin - Recognized as one of the superior flavonoids because of its marked antioxidant and anti-inflammatory properties. Quercetin is known for its ability to stabilize mast cells and help control allergies. If the asthma is directly related to allergic reactions, then quercetin is an excellent supplement to try. Grape Seed extract - A strong antioxidant that is also very good at reducing inflammation and breaking the chronic pattern of allergy-induced asthma. Cod liver oil - High in essential fatty acids, cod liver oil reduces inflammation, promotes healthy circulation, and is generally strengthening for immunity. MSM - MSM is an organic sulfur-containing nutrient, a naturally-occurring compound in the environment and in the human body. Sulfur is necessary for the structure of every cell in the body. Hormones, enzymes, antibodies, and antioxidants all depend on it. Because the body utilizes and expends it on a daily basis, sulfur must be continually replenished for optimal nutrition and health. MSM has anti-inflammatory properties. It boosts immunity and is helpful for allergies. 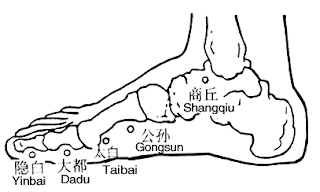 Practiced for over 2,500 years in various cultures throughout Asia, acupuncture has enjoyed a long history of treating internal medical conditions. 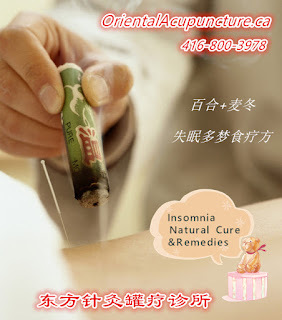 Acupuncture can be very effective in the treatment of asthma. Acupuncture helps to reduce inflammation and balance the major organs that are contributing to one’s symptoms. 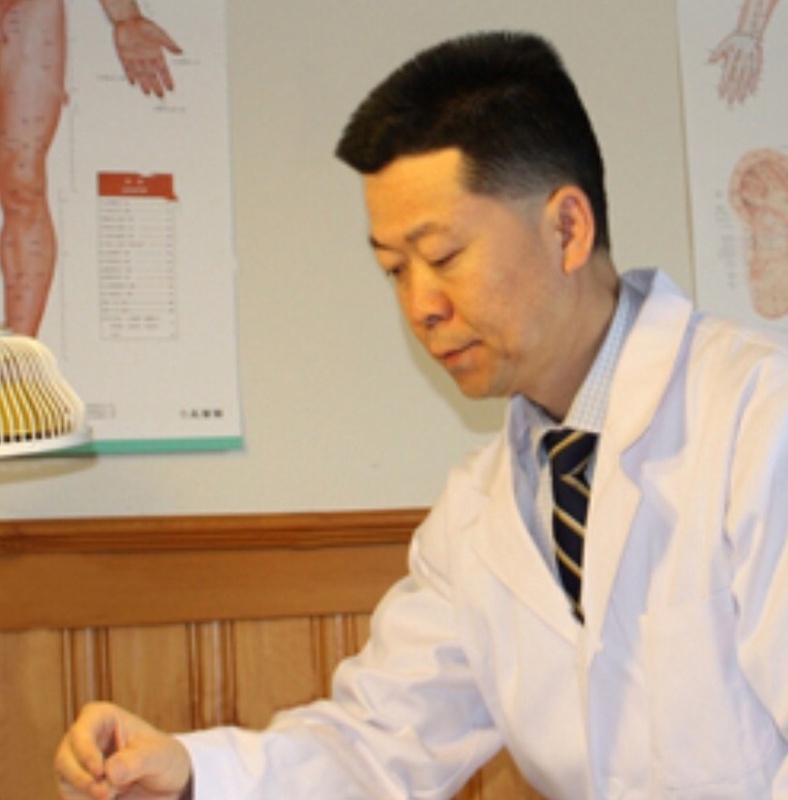 In Chinese medicine, asthma can be caused by a variety of factors including stress, diet, allergies, candida infection and constitutional weakness. All of these factors are related to different internal organs that are causing the lungs to constrict. Acupuncture theory involves combining the patient’s symptoms with pulse and tongue diagnosis to get a clear picture of the body’s inner workings. 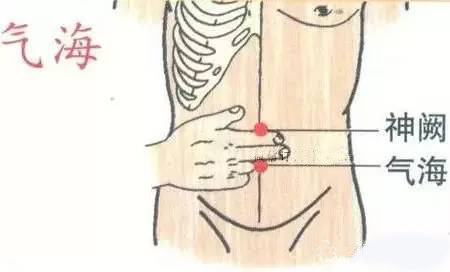 Acupoints are used on the corresponding meridians that will balance any energetic or functional disharmonies. Adjunctive therapies are also very helpful for asthma, such as cupping and Skin scraping. Anytime the asthma is in remission, we recommend undertaking deep breathing exercises as much as possible. Ujayi breathing in yoga is a very helpful practice for building lung capacity and strength. This is a long, exaggerated breath that is coordinated with each asana (yoga posture). Many of the chest opening asanas are healing for the lungs as well. Pranayama exercises such as the one minute breath and alternate nasal breathing are beneficial, especially is done on a daily basis. The one minute breath involves inhaling as slowly as possible for as long as possible, holding for as long as possible, then exhaling for as long as possible. Try to build up to a full minute of doing this. 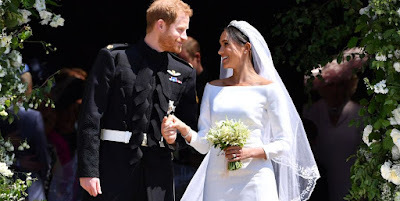 Alternate nasal breathing involves plugging one nostril, then inhaling deeply through the other, switching sides, then exhaling slowly and fully, inhaling deeply, then switching sides. This can be repeated several times.